Say, remember a few years ago when the government was giving people money to ditch their old car in exchange for something shiny and new? It saved the American car industry and fixed the environment, right? According to new report by the Brookings Institution think tank in D.C., the answer is "kinda, but not really." 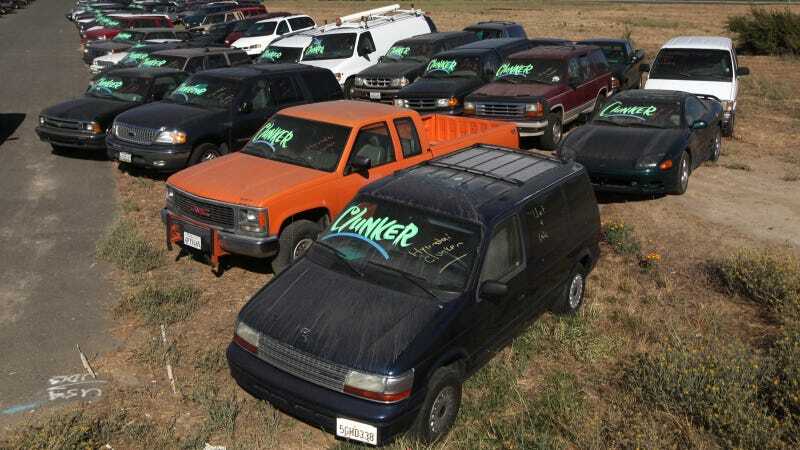 You'll recall that Cash for Clunkers gave buyers up to $4,500 in vouchers to trade in older cars for new one. The goal was to stimulate then-lagging auto sales and hopefully get old, smog-spewing vehicles off the road for good in exchange for newer, cleaner ones. But the Brookings Institution reports Cash for Clunkers wasn't all that great as far as economic stimulus programs go. As noted in the Washington Post, almost any other program would have been better in that regard. [The Brookings Institution's Ted Gayer and Emily Parker] estimate that pulling these vehicle sales forward probably boosted GDP by about $2 billion and created around 2,050 jobs. That means the program cost about $1.4 million per job created — far less effective than other conventional fiscal stimulus measures, such as cutting payroll taxes or boosting unemployment benefits. Emphasis mine. More cost-effective ways of adding those jobs include reducing the employee and employer payroll tax and boosting unemployment aid, they say. The Post cites another study that said the 2009 Recovery Act could have been 30 percent more effective had it focused more on aid to states and payroll tax cuts. Another issue is whether Cash for Clunkers really aided car sales in the long run. The Brookings people say Cash for Clinkers just made Americans purchase cars slightly earlier than they would have otherwise: Cumulative purchases in 2009 were basically unchanged, the report says. Now, it's not all doom and gloom when it comes to Cash for Clunkers, except of course for all those genuinely awesome performance cars that got junked in the process. The Post says the program was indeed successful at cutting down on carbon dioxide emissions — the equivalent of taking up to 5 million cars off the road for a year even though only 700,000 old cars were traded in. However, they say it would not have been as cost-effective as implementing a carbon tax. The 2011 Resources for the Future study found that Cash for Clunkers increased average fuel economy in the United States by just 0.65 miles per gallon. But, similarly, that study found that there were far cheaper ways to achieve similar savings. There are a couple reasons the savings might have been so small. For one thing, the fuel-economy requirements were relatively lax: A person could, in theory, trade in a Hummer that got 14 mpg and get a $3,500 voucher for a new 18-mpg SUV. What's more, the gain in efficiency would be partially offset by the energy costs involved in manufacturing the new car. It costs energy to build new cars! Shocking. The story closes by saying that the program did have some benefits, like helping to stabilize the auto industry in 2009. However, Brookings recommends that we not try this again when the next recession happens. Once is enough, right?